إن فندق Paradise Island Resort بموقعه الممتاز في هذه المنطقة السياحية هو نقطة انطلاق جيدة لنزهاتك في هذه المدينة المذهلة. يمكن من هنا للضيوف الاستمتاع بسهولة الوصول إلى كل ما تقدمه هذه المدينة النابضة بالحياة. يقع هذا الفندق الحديث على مسافة قريبة من المعالم السياحية الشهيرة. استمتع بالخدمات الراقية والضيافة التي لا مثيل لها بهذا الفندق في هذه المدينة رائعة الجمال. يمكن للنزلاء الاستمتاع بالميزات التالية: تسجيل وصول/خروج سريع, تخزين الأمتعة, واي فاي في المناطق العامة, صف السيارات, التوصيل من وإلى المطار أثناء إقامتهم في هذا المكان الرائع. ادخل إلى واحدة من الغرف 194 وتخلص من عناء نهار طويل بمساعدة مجموعة كبيرة من الخدمات كمثل تلفزيون بشاشة مسطحة, رف للملابس, مرآة, صوفا, مناشف الموجودة في بعض الغرف. كما أن مجموعة الخدمات الواسعة الموجودة في الفندق لضمان راحتك تترك لك الكثير من الخيارات لقضاء وقتك أثناء فترة إقامتك. إن كنت تتطلع إلى إقامة مريحة وهادئة في المدينة، فستجد في Paradise Island Resort بيتك الثاني. يتاح مكان انتظار خارجي للسيارات مقابل AUD 5/الليلة. الحد الأقصى لارتفاع السيارات في ساحة الانتظار هو 2 متر/أمتار. Great location. We were prepared this time and brought our own pool towels (Usually $5 for pool towel at hotel). Late checkout $5 for 1 hour. extra charges for another shampoo/body wash bottle or if you need towels changed. Otherwise rooms are standard and clean and has everything you need. The breakfast looked okay but we did not stay to eat. Offered free parking for the night though. More towels in the room. Furniture in 2 bedroom apartment was old with seat of lounge chairs bottoming out, multiple tears and iron burn marks on carpet, old AC unit, mismatched and dirty dishes in cupboard, dusty louvre bedroom doors, freezer needed to be defrosted and large friendly cockroach in the shower. However, pool area was nice, staff were friendly, breakfast adequate but only plastic cutlery available, handy location to surfers attractions and tram station. Resort obviously caters to a Korean market with its Korean buffet and signage. The main con was a large group of overseas students at breakfast which doesn’t make it conducive for a quiet family meal. Otherwise place was pleasant and clean. Great pool, gym and steam room. Restaurant onsite with buffet style meals and free breakfast included Also offered a $10 late checkout option which was wonderful allowing time for a swim and late breakfast before departure. Rom was generally clean and tidy but a little run down and needed a thorough clean of air con amd fridge. We had an enjoyable stay, the staff were pleasant, the free buffet breakfast a nice inclusion (though the addition of bacon would have been nice), great location and we were able to walk everywhere. My only recommendation would be some renovations, mostly just minor cosmetic things, maybe some more comfortable furniture, but mostly the bathroom could use an upgrade. All in all we enjoyed our time! The proximity to everything, free parking and resort facilities complement a well maintained and happy vibe in this resort. Nightly a secure entry protects this resort from toolies and keeps family safe. Great resort for schoolies. Nice and central, good budget accommodation. Disappointed with the staff member who booked us in. Not a smile or welcome to be had, chewed gum all the way through the booking. Really left a sour note. Other staff however most friendly. Breakfast was good. For the money, the place does offer some nice pools and spa. The river views were pleasant. The staffs were pretty disappointing at the reception. For the money they charged for the stay, I would say it did work out well in the end. 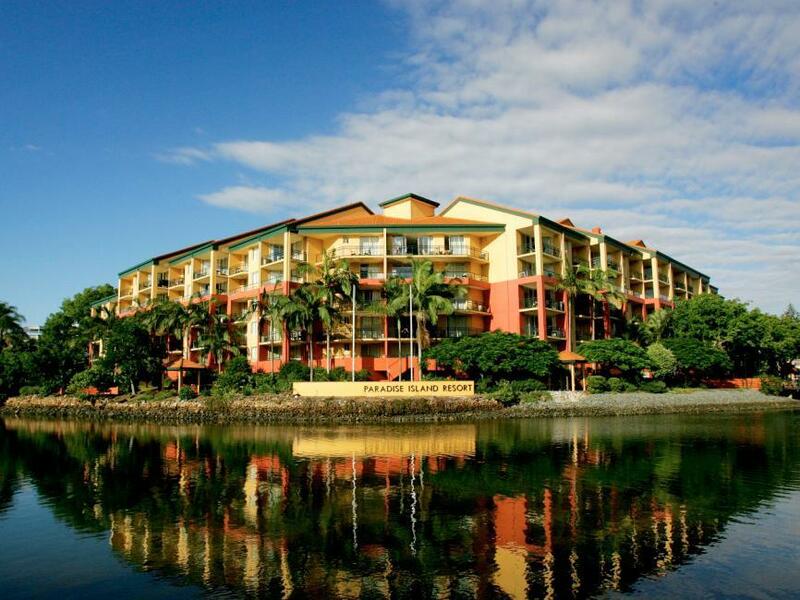 The place is close to surfers paradise so easy access to beaches, restaurants and other facilities. The location was great. The pool is really nice. Free breakfast is a big plus with really good yolky eggs, although they didn’t have bacon for some reason. The room was nice enough with a few marks on the wall. Two singles were pushed together to make a queen which wasn’t great because we couldn’t use the middle of the bed but otherwise the bed was really comfy. They offer free DVD lending which was cool. Overall we had a really good time there. Still plenty of room even with the extra trundle bed in the room. Fresh decor. Ceiling fans and air con in the room. All self contained providing everything you could possibly want. Outdoor pool and spa were lovely. Spa was so hot. Had a pleasant afternoon lounging on the poolside bed. Breakfast was an absolute bonus being included in an already great price. Lots of different options at the buffet. Location was brilliant. Couple of minutes walk to the beach and shops. But the resort is out of the hustle and bustle itself. Very peaceful. Free underground parking made the trip perfect. Will look forward to my next stay. It is a budget hotel. You pay what you get. Staff is nice and friendly. Rooms are serviced after 7 days. Expect dusty carpets, furniture and blankets. Fitouts are old, kitchen equipment are old e.g. toaster, microwave etc. Not luxury or fancy. Added advantage is great location. Breakfast included for everyone. Free onsite underground parking. We recommend for budget visitors. The resort was lovely, but the room needed some renovation. the staff friendly. Over all we enjoyed our stay. close to everything. pool was great.